Granada is known for historic sites, sightseeing, nightlife, spas, and religious sites. 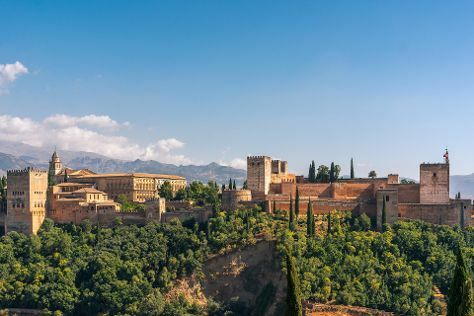 Your plan includes some of its best attractions: explore the historical opulence of Alhambra, appreciate the extensive heritage of Albayzin, take in the architecture and design of Delengua, and don't miss a visit to Dar al-Horra. For traveler tips, more things to do, maps, and tourist information, use the Granada itinerary maker. Barcelona to Granada is an approximately 4.5-hour combination of flight and bus. You can also take a train; or drive. Plan for a bit cooler temperatures traveling from Barcelona in February, with highs in Granada at 13°C and lows at 3°C. Finish your sightseeing early on the 10th (Fri) so you can drive to Seville. Seville is known for sightseeing, historic sites, nightlife, museums, and parks. Your plan includes some of its best attractions: admire the landmark architecture of Plaza de Espana, browse the exhibits of Royal Alcázar of Seville, contemplate in the serene atmosphere at Seville Cathedral (Catedral de Sevilla), and head outdoors with Estadio Ramon Sanchez Pizjuan. For maps, where to stay, other places to visit, and tourist information, read our Seville itinerary maker. Drive from Granada to Seville in 3 hours. Alternatively, you can take a bus; or take a train. Expect somewhat warmer temperatures when traveling from Granada in February; daily highs in Seville reach 18°C and lows reach 8°C. Cap off your sightseeing on the 14th (Tue) early enough to catch the train to Madrid. Madrid is known for sightseeing, museums, parks, shopping, and fun & games. Your plan includes some of its best attractions: examine the collection at Museo Nacional del Prado, don't miss a visit to Puerta del Sol, stroll through Retiro Park (Parque del Retiro), and steep yourself in history at Plaza Mayor. For other places to visit, ratings, maps, and tourist information, use the Madrid vacation trip planner. Traveling by train from Seville to Madrid takes 3 hours. Alternatively, you can fly; or drive. Traveling from Seville in February, expect Madrid to be little chillier, temps between 13°C and 2°C. Finish your sightseeing early on the 17th (Fri) to allow enough time to take a train to Barcelona. Barcelona is known for sightseeing, parks, historic sites, nightlife, and museums. Your plan includes some of its best attractions: admire the landmark architecture of La Sagrada Familia, take in the architecture and atmosphere at Barcelona Cathedral, take a stroll through El Barri Gòtic, and see a performance at Magic Fountain (Font Magica). For maps, more things to do, traveler tips, and tourist information, use the Barcelona travel itinerary creator. Take a train from Madrid to Barcelona in 3 hours. Alternatively, you can fly; or drive. Traveling from Madrid in February, plan for somewhat warmer nights in Barcelona, with lows around 7°C. Cap off your sightseeing on the 22nd (Wed) early enough to travel back home.